The vanilla races of Azeroth are getting a pretty major aesthetic overhaul with World of Warcraft’s fifth expansion, Warlords of Draenor, but some of the newer races are getting a quick nip tuck too. 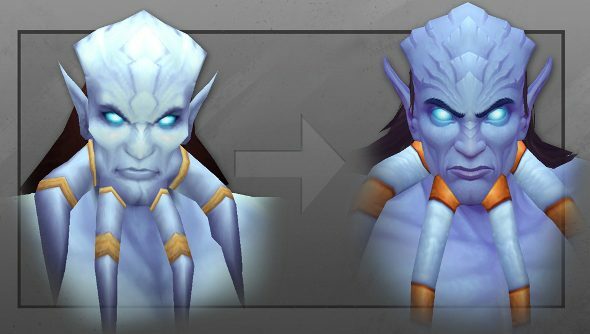 The latest Artcraft reveals the male Draenei’s new look. It’s a much subtler change than what’s been done to the original races. The Draenei were introduced as a playable race back in the game’s first expansion, Burning Crusade, along with the Blood Elves. The models were considerably more detailed, and have stood the test of time a lot better than their predecessors. “The original was one of the better character models in the game, so it didn’t require a ton of translation—but with higher-resolution textures and more polygons to work with, we were able to bump up his fidelity quite a bit, as well as improve how we convey emotion through a new animation rig,” art director Chris Robinson explains. Head ridges are more pronounced, as is the Draenei’s musculature, making him look less like he’s made of clay, but also a little bit like he’s been juicing. Naughty Draenei. So far the emotiveness of the new models has been impressive, giving them a lot more character than their originals exuded. It doesn’t feel so much like an overhaul, rather it’s like Blizzard’s more able to have their original vision reflected in the characters. World of Warcraft has always been a game that oozes charm and personality, so it only seems right that its character models can now do the same.